When processing multiple data points in the mind, cognitive work can become a highly stressful activity. It’s amazing how many leaders are not equipped with cognitive tools to manage uncertainty across situations, close their knowledge gaps and achieve expected results. When a situation includes more than seven variables, it’s well-known that the human mind is not able to process this level of complexity. Think how we receive, process and remember phone numbers. Our minds are not wired to synthesize 10 or more digits at a time. In the U.S., people think about the 10 digits in a pattern of a 3-digit area code, a 3-digit prefix and 4-digits for the line number; our minds consume, process and recall smaller chunks of information. When multiple changing variables exist, that’s the type of stress professionals experience every day in their minds as they perform their risk-reward trade-offs. Without additional cognitive capabilities, leaders turn to their gut as a place to find answers; often, though, the gut isn’t a very good logic engine. Operating risk is introduced when critical thinkers and decision makers do not have access to complementary, cognitive tools to perform their cognitive activities at their best. The challenges increase further for critical thinkers and decision makers when they communicate with their stakeholders, peers and dependents to gain agreement about multiple, interdependent variables. These heterogeneous thinkers add new perspectives to the decision process, which increases the complexity. Often, we hear professionals say, “if I could see what’s in the minds of the people I’m working with, that would help me address the challenges I’m aware of, too.” Yet, given human limitations, most professionals can’t bridge that gap effectively. If meetings involved the ability to demonstrate thinking patterns, that would help professionals overcome this human hurdle. As professionals join meetings, they commonly bring their mental models and biases from years of experience. Their mental models create barriers to synthesizing other people’s perspectives as well as new ways of thinking into their own thinking. Where they use their voices and presentation software to convey their thinking, most attendees try to follow the logic rather than elevate their own thinking. If they had a way to unify their thinking through the visualization of evidence that focused on addressing questions of uncertainty and their critical thoughts, they’d optimize their time, learn to pre-solve issues and focus on better outcomes together. That would advance productivity in thinking in a visual way. When professionals conclude their meetings with follow-on questions, leaders wonder which questions weren’t brought up? Are their teams going down the wrong paths? How do these questions connect to the stakeholders’ objectives? Are they considering the Hard Trends based on future facts that are shaping the future? Professionals expend valuable time to get to clarity as they reflect on their learnings when they need insights and foresights more quickly. 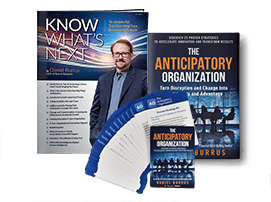 Anticipatory leaders seek to institute advanced collaboration processes that yield greater productivity among their teams. They see everyday innovation and breakthrough thinking as a competitive advantage today as well as tomorrow. To gain an advantage in today’s world, cognitive teams must pre-solve issues through a continuous flow of cognitive insights and foresights. To achieve their objectives, they must find new wisdom within the cognitive gaps in their minds — i.e., to get from “here” to “there.” “Here” is where they are today in context to their cognitive responsibilities. “There” is where they need to go. This cognitive gap represents their current state and target state of their subject profiles. Their stakeholders depend on actionable knowledge and wisdom from their team of thinkers to improve business results. This starts with the capabilities of their cognitive resources and tools.